Lindsey Lettvin, our sister / sister-in-law, recently brought her baking company, Triple L Bakery, to Etsy. Lindsey lives in Boulder, Colorado, and this isn't the first time we've featured her cooking on TCV. Her Paleo Energy Snacks are unbelievable. She makes us all jam thumbprint butter cookies for the holidays and surprised all the dads with sugar cookies this past Father's Day. She started out as a baker at one of her first jobs during college, and now she's circling back to her love of the craft. 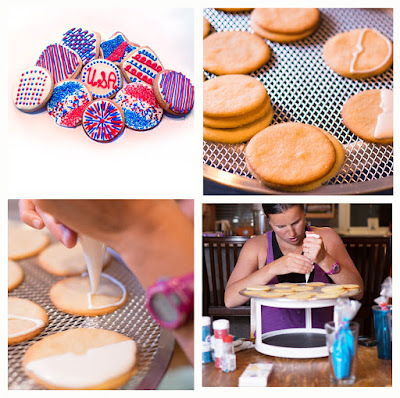 Here's more about Linnie and her work below; please contact her via Etsy if you need cookies for an upcoming celebration, an awesome gift, or to chat with her about placing a special order request. We have a lot of respect for her skills in the kitchen and think you're really going to enjoy checking out what she's working on these days. 1. The Chubby Vegetarian: You're vegetarian now, right? How did that come to be? Lindsey Lettvin: Yes! We were Paleo for more than 2 years, and my husband, Moishe, has been wanting to make the veggie switch for a while. We decided, as a family, to become vegetarian three months ago and have not looked back. I don't miss meat one bit. I was vegetarian in high school and vegan for a couple of years then, too, so cooking that way comes naturally to me. 2. TCV: Let's reminisce about your start at Blue Heron Bakery in Olympia, Washington. How did you start working there, and what was it like? LL: Blue Heron holds a special place in my heart. And they just expanded and moved locations to a beautiful space, so yay for them! I landed the job because at the time, my roommate knew a woman named May who worked there, and they needed help. They trusted that I would learn the ropes and hired me. It was my first professional bakery job, and it was just a lovely group of eccentric people who shared the joy of baking together. We were like a little family. 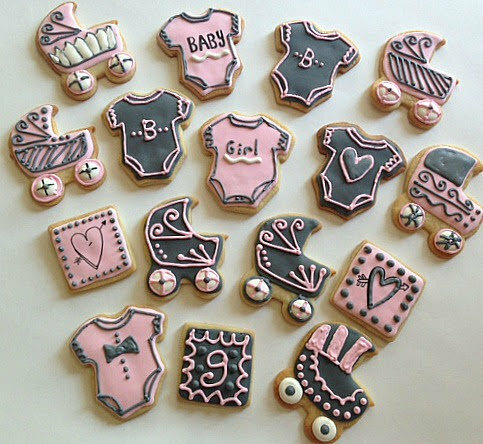 I was the cookie baker, along with a few others, and my job was to make hundreds of cookies a day, like 8 different varieties. Some of my favorites are the Turbo cookie, which is loaded with eggs and turbinado sugar and about as big as one's head, no kidding! It is heavenly. And we did these awesome Fudge Bars and Date Bars with an oat crumble on top -- they still make them! -- that I had to sample every day. Oh, and Evan makes the best Orange and Chocolate Biscotti I have ever eaten. 3. TCV: So, why cookies? LL: Because who doesn't like to indulge in them every now and again?! Seriously, I baked in college and that was one of the most satisfying jobs I have ever had. I'm trying to recreate that now and bake because I am passionate about it, and it is something I would be doing anyway, whether for fun or for a job. I love how cooking and baking zone me out; I get into the flow and am present and just thinking about what I am doing at that moment. It is my peace. 4. TCV: What are some of the must-have ingredients for your cookies? LL: Of course, butter and sugar. I only use organic eggs and pure vanilla extract. I am working on more recipes, so if I'm using gluten-free flours, I am picky about which ones work well. I have found that I like the Pamela's brand the best for texture and taste. And I recently rolled out a Gluten-Free Oatmeal Raisin Cookie, which features organic raisins and organic oats. So, for me, when it doesn't break the bank, I like to use organic. 5. TCV: Will you do custom orders for different occasions or needs, and what about special dietary considerations? 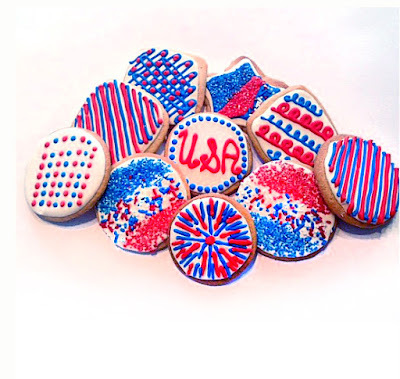 LL: Yes to custom orders -- since cookies have a shorter shelf life, I am basically doing a custom order every order I get. That is to say, when I get an order, I don't have it sitting and ready to go. So, if you have a certain design idea or color scheme (or want only gluten-free or organic ingredients), I can do it. I am flexible and really just want to give my customers what they want, so tweaking colors, shapes, ingredients is easy for me because I am the only employee, and it is a small business. I also can do nut-free orders, gluten-free, and vegan versions if requested. Thanks so much, Amy and Justin, for having me on TCV! We were instantly transported halfway around the globe by the aroma of toasted mustard seeds and the smell of fresh curry leaves. Again, we found ourselves using unfamiliar ingredients that took a little searching to find, but without them, the recipe just wouldn't be the same. 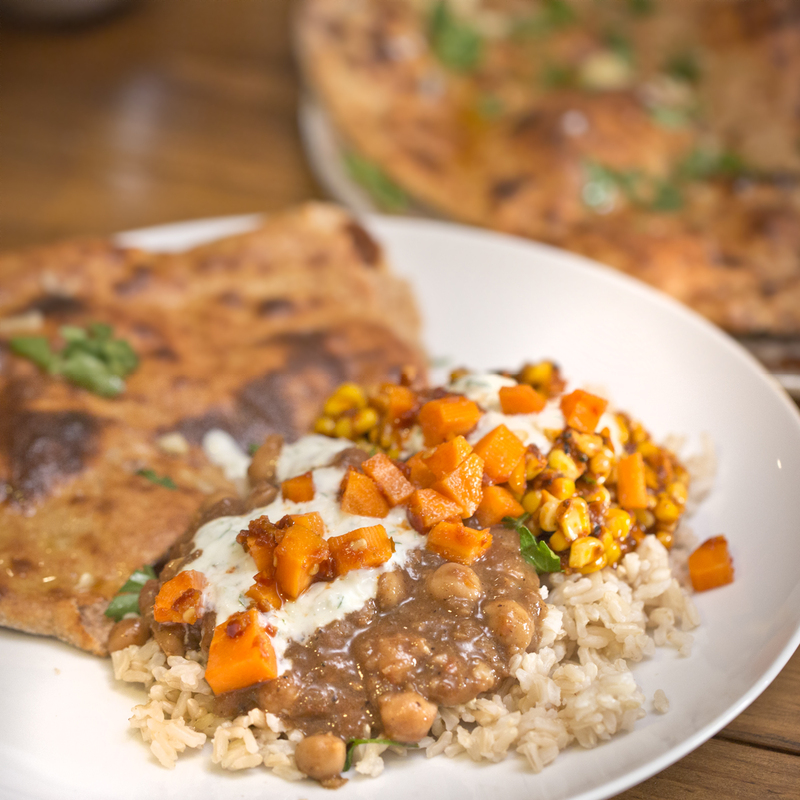 As a bonus, we got to expand our kitchen vocabulary thanks to Raihana of Raihana's Cuisines; she's the co-winner of our first-ever recipe contest along with Lys Green and her Chana Masala. Raihana's Curried Corn recipe calls for curry leaves, not a common sight in our kitchen, but we'll be picking them up anytime we see them now. They are the leaves of the curry tree which, confusingly enough, has nothing at all to do with the spice powder mixture. They are extremely fragrant, and any fan of authentic Indian cuisine will pick up on the flavor immediately. "I love curry leaves!" Raihana said when explaining this recipe on her site. "They give food a really amazing taste." We made this dish for one big Indian feast the other night, and it was so good. 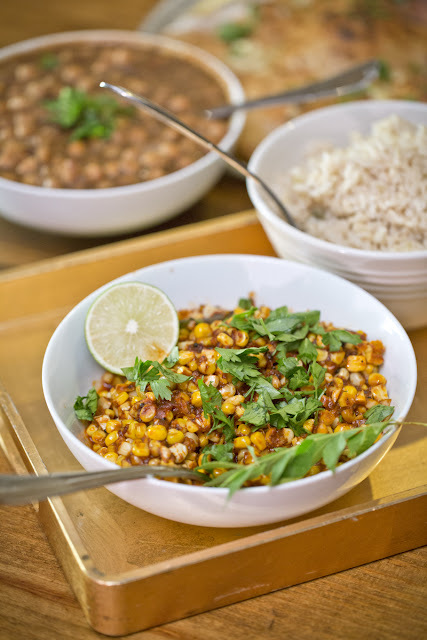 Raihana suggests taking her curried corn dish to a potluck. We second that -- especially now since the corn here in the South is already pretty good and sweet this season. One commenter suggested trying it as a dip, so we scooped up some leftovers with our favorite white bean tortilla chips for a little snack the next day and loved it. Think about picking up a few ears at the farmers market in your town this week or grab the non-GMO corn available at Whole Foods and give this amazing recipe a place at your table. Here's a simple side dish for your outdoor grilling plans this weekend. You might've already picked out your main, but you need something else, something special that everyone will like. We have got you covered with this caprese salad with a Mexican twist! 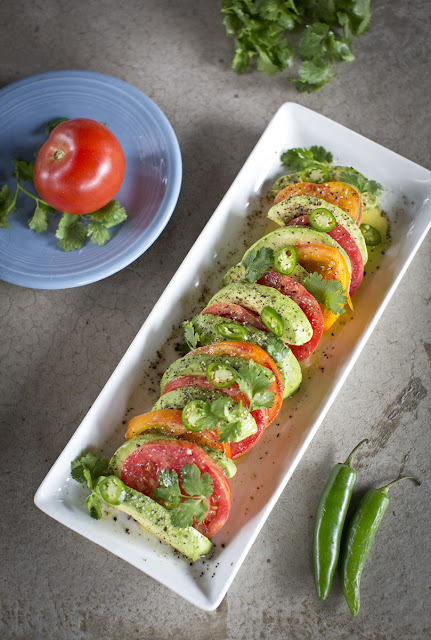 The avocados stand in for the typical buffalo mozzarella, and cilantro takes the place of fresh basil. Now is the time that locally grown tomatoes are starting to appear. We found these beautiful organic heirloom varieties yesterday. 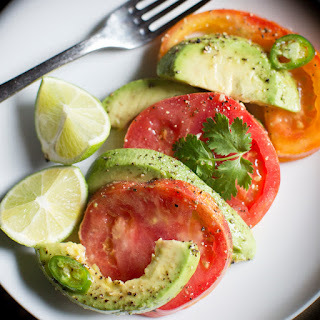 All you do is slice them up with some ripe avocadoes, add a few touches, and you are done. Your guests will love it. We had so much fun with our first-ever recipe contest! Many of you entered your creative recipes, and we are so thankful you did. We chose our three finalists because each of the recipes pushed us in a new direction in the kitchen with unfamiliar-to-us techniques and ingredients. It was a close race, but in the end, we had a tie game. Both recipes that won the most votes are authentic Indian recipes, so last Sunday night, we decided to have a feast and make both Lys Green's Channa Masala and Raihana's Cuisine's Curried Corn along with our own homemade Whole Wheat Naan and some cucumber and mint raita. Everything went so well together, and the bright acidity of the corn contrasted nicely with the warm cinnamon and clove in the masala. Seriously, it was one of the best Indian meals we've ever made at home. Lys Green says she never grew up eating Indian food, but her husband is Indian, so over the years, she learned to cook authentic Indian food. 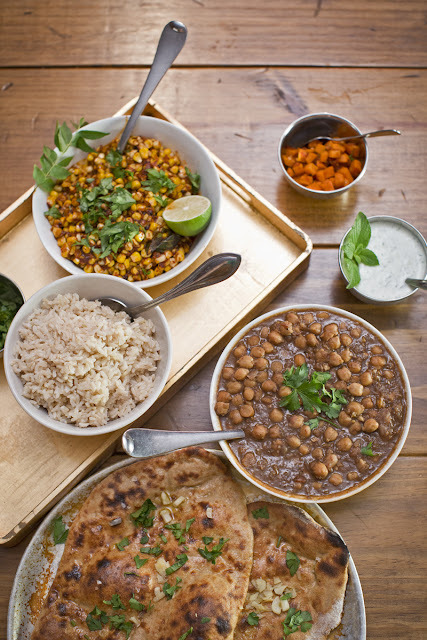 On a trip to India, she fell in love with his aunt's chana masala. 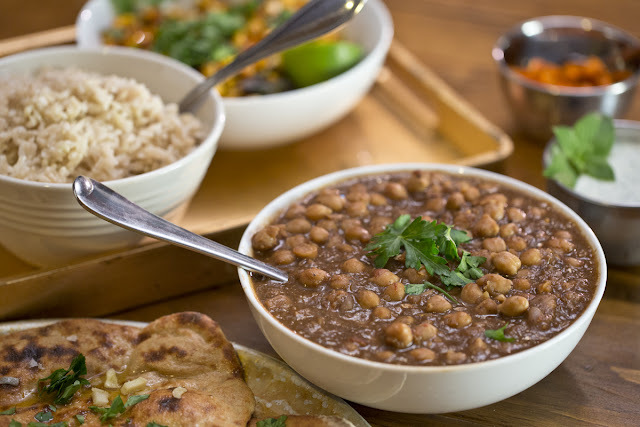 After inquiring how the chana masala was made, Lys was able to formulate a recipe that not only meets the authenticity of traditional Chana Masala, but also meets the healthy requirements that she strives for in her own kitchen. Don't be intimidated by the ingredient list. We went to a well-stocked Indian grocery and had no trouble finding everything we needed. We also learned a lot about what goes into an authentic Indian dish. The amchoor powder is an ingredient that we'd never used before, but will certainly use again. It's dried mango powder that adds sweet and savory notes to the dish as well as a bit of acidity. The anrdana powder is another ingredient we'd never worked with, and it offered a nice surprise. It's dried and ground pomegranate seeds that, when tasted on its own, is as sweet as candy. In the dish, however, it acts to balance the warm, earthy flavors with a hint of sweetness. You'll want to make the extra effort to gather the ingredients for this recipe. Once you have everything in front of you, it all comes together very quickly. Next up, we'll share Raihana's Curried Corn, so be sure to check back in soon for that. In a large pot, heat oil over medium-low heat. Add in the garlic, ginger, and red onion. Cook until the onions begin to sweat and are slightly translucent, about 5 minutes. Add in the tomato puree and cook another 3-5 minutes, stirring as not to burn. Add in all spices (kale salt, amchoor powder, anrdana powder*, channa powder*, cumin, cinnamon, & clove). Allow these flavors for develop, cooking on medium-low for another 5 minutes, stirring as needed so the mixture doesn't burn. Add in the garbanzo beans and allow the beans to cook with the onion-tomato-spice mixture on medium-low for another 3-5 minutes, stirring as needed to keep the ingredients from burning. At this time, add in the water -- it'll be 1 1/2 to 2 cups or until the beans are slightly covered. After adding water, bring the curry to a boil, continuing the boil for up to 5 minutes. Keep an eye on the pot so it doesn't boil over. Afterwards, reduce the heat to a simmer, cover the pot and allow the curry to thicken for at least 20 minutes. Serve over rice. Pizza…you love it, we love it, everyone loves it. We just wish it wasn't so junky most of the time, so in case you feel the same way, here's a great remedy. 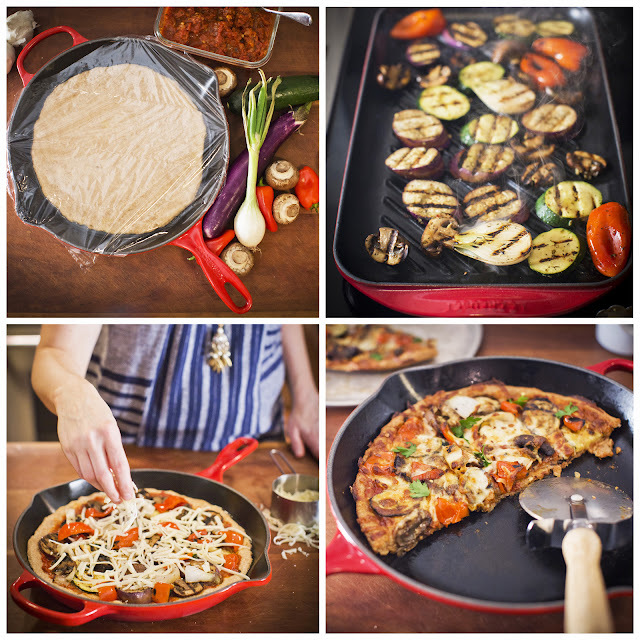 We packed a grill grate's worth of vegetables into one pizza this past weekend! The crust is made from sprouted whole wheat, and it's really a better choice in terms of both nutrition and taste. We used a cast iron pan and a bit of olive oil to give the crust its unique texture. We are proud to partner with The International Housewares Association to bring you this great recipe. Check it out all the details on their blog, The Inspired Home, and check back often. We are working on a few tasty recipes for cooking over an open fire in your own backyard. This dessert defies all expectations! It's made from only whole ingredients, it's vegan, gluten-free, sugar-free, low-fat, and yet it's still super delicious. We tested this one out on some guests last Saturday, and it was a hit. The secret is freezing the bananas before blending them, which gives the whole pie a creamy, airy texture that's really appealing. Peel the bananas and freeze them for at least 3 hours. Into the work bowl of your food processor, place the peanuts and pulse until finely chopped. Into the bottom of a springform pan, spread finely chopped peanuts in an even layer. It's a tie! With 19 votes each, Lys Green's Chana Masala and Curried Corn by Raihana's Cuisines will be featured this month on the blog. Can't wait to share these wonderful new dishes with you -- we think they'll be great together! Thanks to all who voted -- we'll get cooking and post the results here soon.